Our position is our strength. As a European manufacturer we have optimum insight in Scandinavian and European customers’ needs and requirements. For this reason we adjust ourselves more rapidly to changed market conditions. Our efficient set-up around production and logistics has resulted in a delivery security which many within this business envy us. Quality has many faces. For us it is the experience of quality in all connections that is important. The quality that emerges from the entire company. The good quality that can only be obtained with well-trained, engaged, and flexible employees at all levels. Not just of the individual product but in all functions where people are involved. We proudly attribute our success to this attitude to quality. Wicker is Da’core’s series of garden furniture made of high-quality, artificial fabric fibres. In spite of the fact that the fabric is artificial, Wicker has the glow and warmth from natural materials such as bamboo and sea grass. This means you will get a beautiful natural look in your garden, on your terrace or balcony. That Wicker is an artificial fabric means that it is weather resistant, for which reason you can leave your furniture outside in all kinds of weather. As, in addition, it only needs a minimum of maintenance, you can spend your time enjoying your garden and the outdoor life instead. In the Wicker series you can get everything, from super lounges to plain stackable chairs. Garden furniture from the Aintwood series is designed especially for the sometimes unstable summer weather which may change from high sunshine to extreme rain. Aintwood will not be influenced by the changeable weather and requires therefore not much maintenance. You can easily keep your Aintwood garden furniture clean by washing it with a cloth or wash it down once with the garden hose. As to winter storage, it is a good idea to place the furniture at a dry place. If it is not possible for you to find a dry place, you can leave them outside. It will, however, be an advantage to cover the furniture with a Da’core furniture cover which you can buy in the shop where you have bought the furniture. After some years the colour of the furniture may be bleached by wear and tear and the UV-beams of the sun. 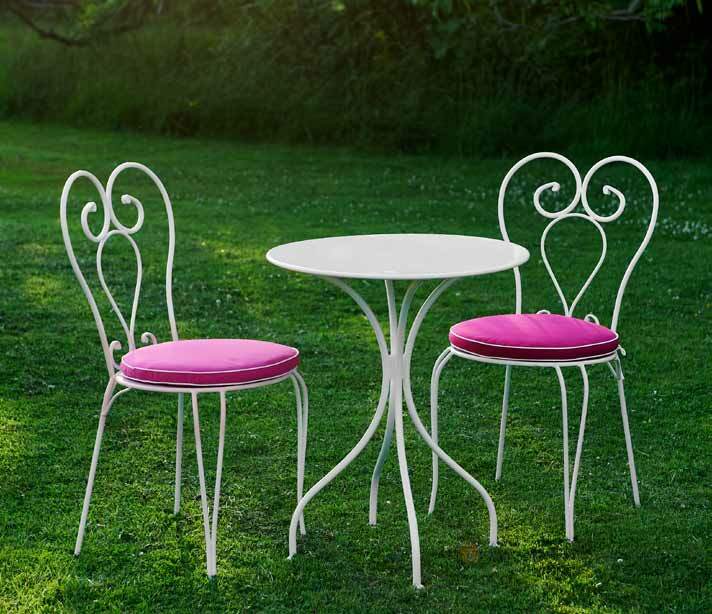 You can easily refresh your Aintwood garden furniture by applying an ordinary acrylic paint. The best way to clean your plastic garden furniture is to use running water and a soft brush or a wet cloth. In case the furniture is very soiled, it would be a good idea to use a hand washing-up liquid or brown soap. Do not use ammonia water or wax agents as they usually contain solvents which may damage the plastic. In winter you should take your plastic garden furniture in an outbuilding or cover them with a Da’core garden furniture cover. Aluminium is a lightweight metal characterized by the fact that it does not rust. For this reason it easily stands up to a summer in the open air. Furniture made of aluminium is on the whole free of maintenance. Clean it with water and a soft brush. In case the furniture is very soiled, you can wash it with a hand washing-up liquid. For all furniture in aluminium or with aluminium frame it is important that you do not flush it with a high-pressure cleaner as the hard effect from the high water pressure will spoil the surface of the furniture. Even if seat and back are made of teak, it does not require any particular maintenance, but if you wish that the teak keeps the warm, dark glow, you need to treat the wood with teak oil. Click here and read more about how you maintain teak wood. In winter you should store the furniture in an outbuilding or cover it with a Da’core garden furniture cover.